SATURDAY morning has come round again, and instead of the usual mid-week Presbyterian breakfast of porridge and blueberries, we splash out: poached egg (a free-range Swiss egg with a very orange yolk) on half a wegli (a traditional Swiss bap), with two grilled rashers of traditional Swiss bacon. The anticipation is almost as good as the experience. But today, as I tuck into my Saturday treat, I’m feeling uncomfortable. If the World Health Organisation (WHO) is to be believed, it’s going to kill me. I should already have known about the bacon death threat. The media have been running these scare stories for years. Here’s Swedish Radio in 2015: ‘Bacon, sausages, and hot dogs do cause cancer.’ They go on to quote the WHO, which stated that processed meats such as bacon, sausages and ham have for the first time been listed as carcinogens alongside cigarettes and asbestos, and they showed a causal link between processed meats and colorectal cancer. Even 50 grams of processed meat a day – that’s less than two slices of bacon – increase the chances of developing this cancer by 18 per cent. In addition, they claimed, all red meat was probably carcinogenic. Suddenly, Saturday mornings aren’t looking so much fun. But Rickard Bjerselius, toxicologist at Sweden’s National Food Agency, tried to reassure us: ‘We don’t know for sure, but there are several factors that are said to work together, such as salt and nitrates, as well as cooking at high temperatures, such as on a barbecue.’ He added, magnanimously, that his recommendations should not adversely affect lifestyles. Not so the WHO. In their ‘Q&A on the carcinogenicity of the consumption of red meat and processed meat’ they define red meat as ‘all mammalian muscle meat’; and processing as the transformation of these meats through ‘salting, curing, fermentation, smoking and other processes, to enhance flavour or improve preservation’. Their claim is that epidemiological studies suggest that small increases in the risk of several cancers may be associated with high levels of red meat or processed meat consumption. And it’s not just the meat itself, or even the processing. High temperature cooking methods generate compounds that may contribute to carcinogenic risk, ‘but their role is not yet fully understood’. There’s a lot about carcinogenic chemicals when exposing meat to high temperatures or even naked flames – you know, all those polycyclic aromatic hydrocarbons your mother didn’t warn you about. But in spite of these dire predictions, they also have to admit their evidence is limited. It’s more a case of might be or possibly or even just what if? Goodness, it’s beginning to sound like Pascal’s Wager – don’t eat it, just in case. And the number of fatalities attributable? According to the Global Burden of Disease Project, approximately 34,000 cancer deaths a year worldwide are attributable to diets high in red meat. Please note – that’s worldwide. The current world population is estimated at 7.7billion. At the same time, annual worldwide death rates from other types of cancer are just a tad more worrying. So this red meat threat seems a bit hysterical. The WHO admit (reluctantly?) that eating meat has ‘known health benefits’. Their problem is that they can’t get data to enable a conclusion about whether there is a safe level of consumption, and they haven’t even got round to evaluating the cancer risks of eating fish or chicken. The reality is that colorectal cancers are due to a very wide range of factors, of which red meat consumption is a very small element. According to Wikipedia, most colorectal cancers are due to old age and lifestyle factors, with a small number of cases due to underlying genetic factors. Risk factors include diet (specifically consumption of red meat, processed meat and alcohol), obesity, smoking and lack of physical activity. Add inflammatory bowel disease, genetic disorders, hereditary nonpolyposis colon cancer, and so on. The WHO report cited two reasons for processing meat: enhancing flavour and preservation. I would suggest that the latter is by far the more important. The techniques developed to preserve foodstuffs were not indulgent. They were there to ensure survival. If, for example, you lived in Iceland in the 16th century, you had to spend every minute of the short summer growing or collecting food you could preserve in jars, and catching food (fish, birds) or fattening it up (mainly cows) that you could then smoke or cure or salt, to see you through the long harsh winter instead of starving to death. It was only when the giant food corporations got their hands on the convenience food market that preservation became less important and flavour enhancement started to take over. Even worse is what has been done to foods such as bacon, sausages and pies. When traditionally made with real ingredients, these items pose no threat to human life other than through excessive consumption. Bacon doesn’t need to be cured using nitrates (ie saltpetre), and certainly doesn’t need to be injected with salt water to increase its weight and the profits of the supplier. The real threat, including all those carcinogens, stems from modern food processing activity, and the sheer laziness and greed of many consumers. I hope you realise that both Muslims and Jews – not great bacon eaters – also die from colorectal cancer. And so again I contemplate my Saturday breakfast. 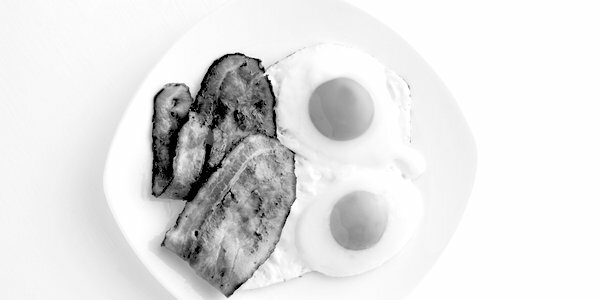 Not just those deadly bacon rashers, but – an egg! Time was we were encouraged to ‘Go to work on an egg’. Later eggs were deemed poisonous (and not just because of salmonella). The evil cholesterol was lurking, and they told us that porridge was better. I leave you with this clip showing a responsible breakfast eater preparing his repast according to the recommended quantities. Seven grams of bacon, and about the same for the sausage. As for the egg – a tricky one, because he’s only allowed a small fraction of a whole egg – and should that be white or yolk? I can only assume his Saturday treat is a bit dreary. It would fit nicely on to a coffee saucer, not my normal breakfast plate. This whole nonsense smacks of bureaucrats in search of a purpose. I’m very much happier being a normal person in search of a yummy breakfast. Just don’t forget the wegli!